Congratulations to everybody who participated in this year's Peacock Challenge! We had a great turn-out from the Big Island including the winners in both divisions, Patrick Stover (new course record holder) and Bree Wee. This year we had some challenges just to get to the starting line. The Army graciously allowed us to hold the race this past Saturday even as they had war games and training exercises at the same time. Thank you all for your patience at the West Gate, and thank you, Benita, for making sure the process went smoothly. Thanks to Jeff F., Sue, Amanda, Jarren, Glenn, Connie and John for trail marking. Marian/Neil Yasuda, Judy and Rob, Larry, Lee, Julie Ng, Les (the pig wrangler) Omura and Grace, Jill I, Lane and many other at long road aid station. Steve Dewald and family, Andy C., Heather, Rebecca, Ron, Benita, and many more at three-way aid station. Sandi, Myra, Linda, Sean, Laurie at the IN-N-Out Bistro! Steve V, Rosie, Andy G, Kelly, and I think 2 more people helping us out on their bike patrol. I don’t know if I would rather run the crossover or bike it. None of the options seem to look that great for a novice like me. Jeff F, Glenn, Kana, Jacki D for doing almost the same distance as the runners and that just as safety patrol rovers. Rick Otani for following the “last” runner out of the start/finish on the first loop and heading over to three-way to help, only to come back and do the same routine in the evening!! On injured knees. Jacque T, Ron, Jeff F, Glenn to do the course sweeping and taking off the ribbons/signs and rubbish off the trail. At the start/finish, Jeff H, Vanessa, Wily, Connie, Mary B, Iris O, Jarren O, Kathy, Mikey B, Paul B, Melissa B, Kevin C, Brandt, Catherine C, Catlin F, Thomas F, Michael K, Sue, Heather McC, Heather O, and Zoe R the youngest volunteer!! Benita, thank you for staying until the finish to help break down the aid station and to load everything up into the U-Haul. Special thanks to Ashley Dudoit. She offered free massages to the runners after their run!!! I saw on their faces after getting off the table that they felt better already! Contact her if you need a follow-up appointment. have taken it over without your help, guidance, and support. You trusted us enough to go ahead and take this race back into the HURT trail series. We are looking for a speedy recovery for you PJ so you can be ever present at check-in and time tracking. We all missed your presence at the race, you are always in our heart! Thank you, Kana, for taking photos in the trails and Johnny Lingao for the finish/awards photos. Click here to view the gallery. Click here for more awesome photos on Facebook taken by Mikey Brown from Big Island. Peacock Challenge 55 is upon us this weekend! Freddy and the race management team would like to thank all the volunteers, crews, and family members for putting so much time and effort to make this race happen. The roster list has been submitted to the US Army earlier today (Thursday, 10/19). So if you made it to the list, please don't forget to bring your ID's this Saturday in order to gain access to Dillingham Airfield. For the runners and pacers, this is probably a good time to review the Peacock Challenge 55 Mile Run Information. Race check-in will begin at 4am to accommodate for the possible bottleneck at Dillingham Airfield's gate. The current forecast this Saturday for Waialua is partly cloudy with a high of 87° and 10% chance of rain. 1.) The US Army will take over access control of Dillingham Airfield from October 16 to October 28. So if you have plans to be inside Dillingham Airfield during the race on October 21st for any reason such as to spectate, to volunteer, or to crew your runner, please contact the race director, Freddy, to be added to the roster list. If you are not on the roster list, the Army will deny you entry into Dillingham Airfield. Please have your photo ID such as State ID or driver license with you at all times especially when leaving and entering Dillingham Airfield. If you need to be inside Dillingham Airfield before the race begins, consider the possible bottleneck at the entrance gate and any other scenarios the Army could throw our way. 2.) Freddy still needs volunteers for the race. 3.) DEADLINE: October 19! If you're not on the roster list by then, you will not get access to Dillingham Airfield. 4.) To contact Freddy, email him: freddyhalmes[at]gmail[dot]com. You can also use our Contact page, select "Peacock Challenge 55 mile" as the Subject, and request to be added to the roster list and/or volunteer list. 5.) Please spread the word! If you are on the fence about taking on the Peacock Challenge, it's almost time to make that jump. Saturday, October 7, before midnight. Will we see your name on the list? Congratulations to all who toed the line and ran in the 2017 Tantalus Triple Trek! We hope everyone had a great experience and found this year's event challenging. Click here for the results. Moleka Aide Station: Benita & Arvel Shults, Jessi Duval, Daintry Bartoldus, & Keith Campbell. Our sincerest apologies if we missed anyone. Most of all much thanks and love to John PJ Salmonson our heart and inspiration!!! FYI: By special request the 3T store has been re-opened for the LAST TIME until next Sunday. Expect 1.5-2 months to receive items! Click Here To Order. The big day is just around the corner…the 26th running of H.U.R.T.’s Tantalus Triple Trek!!!! Here are the instructions for race day on Saturday, September 2, 2017. The Start/Finish area is at the picnic table and bathrooms by the Maunalaha trail head (just above the Hawaii Nature Center). Participants may arrive as early as 4:30am. Start time will be around 5:30am (or when John says ‘GOOOOOOO!!!!!!”). Be at the Start/Finish area no later than 5:15am to check-in with John and his lovely helpers as well as receive your race number. Park below the gate on the road leading up to the Nature Center and NOT in the main parking area. Parking is available along the access road to the Nature Center (before the gate) and along Tantalus Drive (near the Makiki pumping station). When parking along the side of the road, have all of your tires off the roadway. A volunteer will be near the entrance of the access road to assist you with parking. Runners will have 9 hours to complete the entire 30+ trail miles. 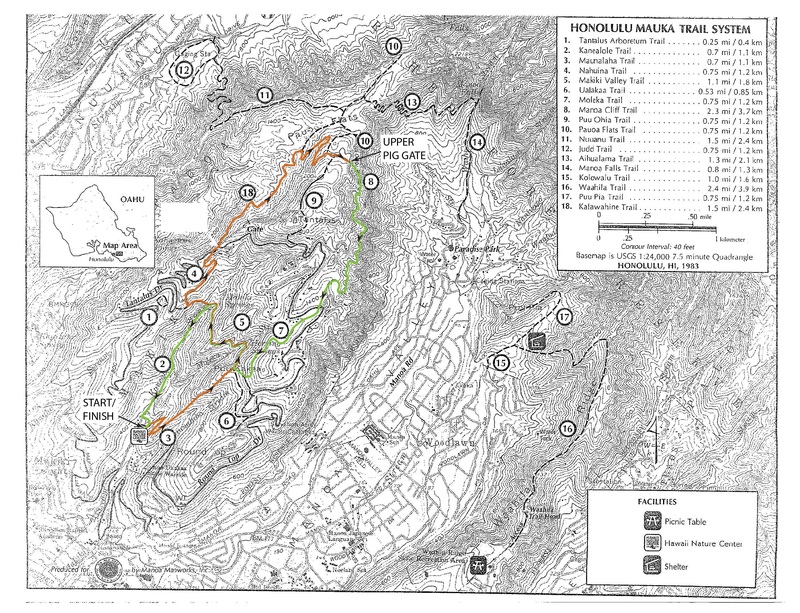 The course will consist of three (10+ mile) loops heading up the Maunalaha trail (Hogsback), across Makiki Valley trail, up Nahuina trail, and along Tantalus Drive. Continue down Kalawahine trail then along Manoa Cliff and Moleka trails, then back across Makiki Valley trail (again) and down the Kanealole (Center/Pipe) trail and back to the start/finish. There will be two aide stations along the course: at the Maunalaha-Kanealoloe trail head (start/finish area) and at the Roundtop Drive road crossing to Moleka trail. Both will be adequately stocked with water, sports drink, soda, fruits (watermelon, bananas, oranges), and various salty and sweet treats (peanut butter/jelly sandwiches, chips, pretzels, gummies, etc.) to keep you going for another loop (or two)! Runners must carry a minimum of 24 ounces of water while on trail as well as supply their own gels, electrolytes, sports nutrition for the race. No aspirin or oral medications will be available. The course crosses two roadways. There will be course marshals at both crossings and at all trail intersections for only the first loop. Thereafter, be careful when crossing these roadways. There will be, not only vehicles, but also cyclists and road runners so be cautious and courteous. This is a long race so a few seconds to be safe is well worth it. Augusto DeCastro and a few others will be along the course taking photographs. So please keep up those big smiles as you never know where they’ll be hiding! As runners finish, we will be having a build-your-own sandwich bar and a few other items for runners to enjoy. Please feel free to join us and bring a dish to share. If you have any questions or concerns, please feel free to contact us via email at hurt3trek[at]gmail.com. Only one last weekend on the trail to get a final loop (or two) in! But before we get to the training details, the 3T Store has been re-opened due to popular demand! You can even personalize your shirt sleeve with your name! The store will close this week Wednesday, August 23. Orders expected to ship by September 12 (or hopefully earlier) and shipping can take up to another 3 weeks. This Saturday, August 26, we will do one full loop of the course. Meet at the picnic and restroom area at the Maunalaha-Kanealoloe trail head (by the Hawaii Nature Center) at 6am. Bring an adequate amount of water as well as any nutrition they may require. Depending on the time of sunrise, a small (handheld) flashlight or headlamp may be needed. If you have not yet been on the race course, make it a point to join us or have someone who does know it to take you on it very soon!! If you will be joining us and haven’t been on the Tantalus trails, please make it a point to remain with the group or be with someone who knows the course. As no pacers will be allowed for the race, it is highly recommended for those not familiar with the course to participate in this final session. This Saturday, August 19, Jeff will be hosting another preview/training runs to go two full loops of the course. Meet at the picnic and restroom area at the Maunalaha-Kanealole trail head (by the Hawaii Nature Center) at 6am. Runners are expected to bring adequate water and nutrition they may require. Depending on the time of sunrise, a small (handheld) flashlight or headlamp may be needed. If you have not yet been on the Tantalus trails, please make it a point to remain with the group or be with someone who knows the course. Here is a map of the course. For those unfamiliar with the trails, feel free to print a copy for reference along the training run. Please feel free to contact us via email at hurt3trek[at]gmail.com . Congratulations to all that enjoyed the Maunawili trail on a beautiful day - great running everyone! Of course, the people that helped each of you in many ways deserve a huge mahalo - please personally thank everyone that volunteered their time and energy so that you could play on the trails. Oahu Na Ala Hele, Kelley Hupp, Jacki Doppelmayer, Judy Carluccio, Rob Carluccio, Jacqueline K. Tellei, Michael J. Lovette-Cole, Brenda C Lovette-Cole, Arvel Shults, Freddy Halmes, Jeffrey Fong, Donielle and Chris Wolfe, Kelly Sutcliffe, Glen Oshiro, Les Omura, Mike Hee, Lane Shimonishi, Teresa Henderson Ullman, Andy Grandinetti, Sue Lohr, Malory Peterson, Sara Santilli, John and PJ Salmonson, Jen McVeay, and many others that went above and beyond to assist. Race photos courtesy of Kalani Pascual and Augusto Decastro. Big thanks to all of you!!! Congratulations to everyone who finished Run with the Pigs! Tantalus Triple Trek (3T) scheduled for Saturday, Sept 2nd is now gearing up and we are EXCITED! More race and training run announcements to come very shortly. In the meantime, we would like to offer participants an opportunity to place an order for 3T race apparel. As the lead time for production and shipping is crazy lengthy, the order window will only be open until the end of this week, Sunday, Aug 13th. Orders are expected to ship directly to you on 8/30/17, and shipping can take up to 3 weeks. So don't delay, click here, and place your order today! When: Saturday, August 5 at starting at 6:00 a.m. Parking – Parking will be very tight. Please see Download Parking map showing our designated parking area. If possible, share a ride to minimize the number of parking spaces needed. Only those who are doing the full out-n-back and leaving their vehicle for the entire race can park in the designated area. Relay teams (and those not leaving a vehicle for the duration) should park temporarily in the lower parking lot. There will be Parking Czars to direct you – please follow their guidance and pull into the inner-most parking stall as closely as practical. Check-In – ALL runners must check in at the start / finish (that means both relay members). The gate to the golf course should be open by 5:30. There is an outside chance it will be earlier than that, but no guarantees. Start – The race will start at 6:00. All runners must be finished by 2:00 pm. If completing the 22 miles in 8 hours is not possible, there is an early start option. However; in order to start early, you must contact Marian (808-221-5171) in advance, carry lights with you, and have familiarity with the course (or be with someone that does). There will be a turn-around cut-off: runners must be out of the turn-around aid station by 10:00 am in order to continue on the course. Relays – Both members of the team must be at the start / finish in the morning to check in and be numbered. The second runner should proceed to the turn-around aid station in Waimanalo (see map) on Waikupanaha Street. When your runner arrives, hand off the car keys and the first runner can return to the finish. Time cut-offs – Runners must finish in 8 hours and be out of the aid station by 10:00 a.m. Golf Course – We have port-a-potties for your use. Do NOT go into the golf course for any reason. Bring your own water to wash up after the run. No alcohol consumption is allowed. Fluids – You must carry enough water for 11 HOT miles. Sixty ounces minimum is recommended. You must bring your own electrolytes and calories to endure the distance. Trail Etiquette – Yield to hikers, equestrians, and other runners. Do not leave the established trail. The pink ribbons will mark the route at both ends of the course. Blue ribbon means BAD; do not go where there is blue. If you drop out of the run, you must notify a race director (Neal (554-5848 or Marian 221-5171). Take care of each other out there! Pau Hana – Please plan to stay and enjoy some food after the run.